Fifty mothers whose children have Down’s syndrome have recorded a touching carpool karaoke-style video to raise awareness of children with an extra chromosome. The recording is fast going viral on YouTube, with over 675,000 views at the time of writing. 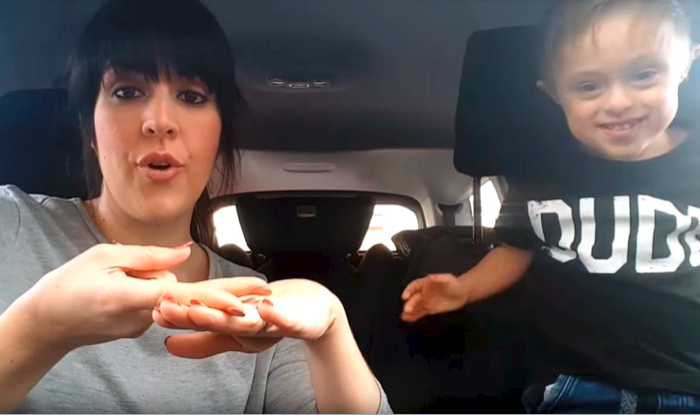 The mums, part of the Facebook group Designer Genes, were reportedly inspired after seeing a carpool karaoke video signed with Makaton, a simplified form of British sign language. Makaton is designed to help hearing people with learning or communication difficulties use signs alongside speech. That video is currently at over 12 million views. Drawing inspiration from the great success of the Makaton video, posted on the SingingHandsUK channel, mothers from across the UK decided to replicate the idea with their children for World Down’s Syndrome Day on March 21. In the video, the 50 mums and their children can be seen doing Makaton to multiplatinum hit, “A Thousand Years” by Christina Perri. i’m so honored they chose my song! But Becky Carless from Coventry, and the mum who came up with the idea for the video – 50 Mums, 50 Kids, 1 Extra Chromosome – disagrees. “We have all cried a lot since the video went live. We have such a sense of pride to show people our children are just like everyone else. “The video dispels a lot of myths about Down’s syndrome. You can see from the video our children don’t all look the same. The group hopes the video will become a worldwide hit. Carless and her 4-year-old son Archie took part in the video. “We believe this video really does have the potential to be the most viewed across the world on World Down Syndrome Day this year,” Carless said. When Carless pitched the idea to other members of the Designer Genes group, it was met with enthusiasm. “It’s really special because we don’t all know each other because we are from all over the country, but now we feel like we do. The group reached out to Christina Perri’s husband, Paul Costabile, on Twitter to ask if they could use the song. Within an hour, the LA-based couple declared their heartfelt support for the idea, committing their multi-million social media following and waiving any copyright claim to the music in support of the campaign. Down syndrome is a genetic condition whereby a person has three copies of chromosome 21 instead of two. The population of people with Down syndrome in the U.S. is estimated at over 400,000, according to the organization’s website.